Julienne and Cyndera are back together again recording in the same space at the same time! Out of their recording closet in San Francisco the Aloha edition of the podcast was recorded in Julienne’s new home on Maui, Hawaii. This tropical edition of the podcast discusses how our sense of place influences our lives, what to do when you are caught between our head and your intuition and the joys of adventure learning to live in a new place. 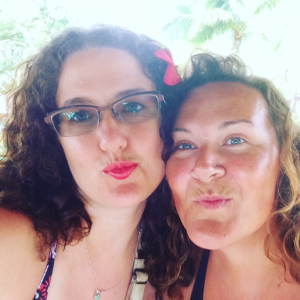 Cyndera shares her experience visiting the fiery beauty of a live volcano and the mythology of the Hawaiian Goddess Pele and the two discuss the foreshadowing events found in the Mana Cards deck years before Julienne’s move. Synchronicity, sun and learning to integrate symbols, intuition and are the themes of this show! Sorry no ukelele serenade this time!. BIG NEWS The Archetypal Tarot Podcast invites you to become a participant! Visit Tiny.cc/tarot for more info! 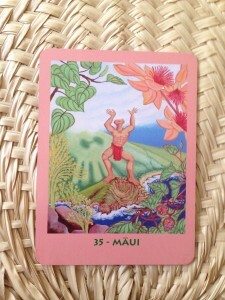 Pic of the Maui card mentioned in the podcast. And surprise! This deck of Hawaiian wisdom is available to purchase! You can buy they direct from the authors from their site or get them via Amazon.